While shopping at Seattle’s University District Market this past Saturday, I halted in front of a gigantic pile of root vegetables. Parsnips, rutabagas, and turnips aplenty. 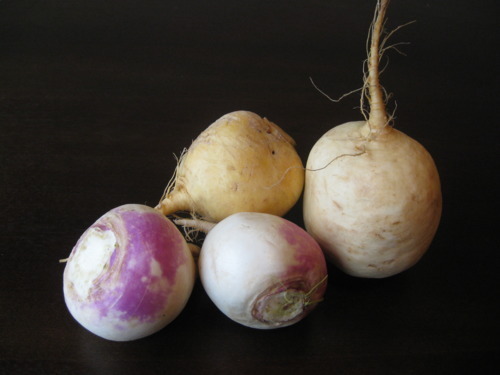 Two different types of turnip. I asked questions. That’s how this works. First off, I’m not sure I’ve ever cooked with turnips before. I wanted some ideas. And I wanted to know, of course, what the difference is between the light gold and the white & purple turnip. What should I expect? The nice lady at Nash’s Organic Produce told me that the golden turnips (those big guys in back) have a milder sweeter flavor and taste good raw, while the purple turnips (the turnips that are, uh, purple) have a sharper, more radish-y flavor, and are better suited to cooking. I didn’t even know you could eat turnips raw. The things you learn at your farmers’ markets! Turnips also store really well. So I went home with my turnips. I took pictures of them. I researched suitable recipes for them. 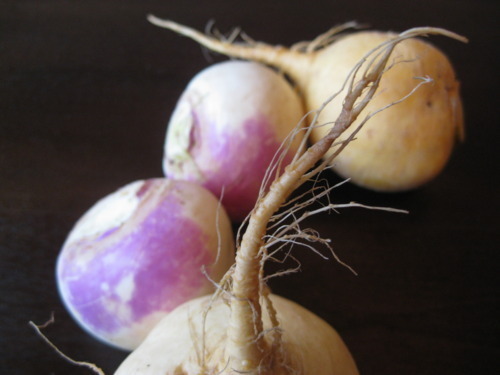 And I peeled them and tried side by side comparisons of the raw flavor of each type of turnip. Raw turnips have a pretty powerful taste, even the sweeter golden turnip! But the purple one was definitely sharper. 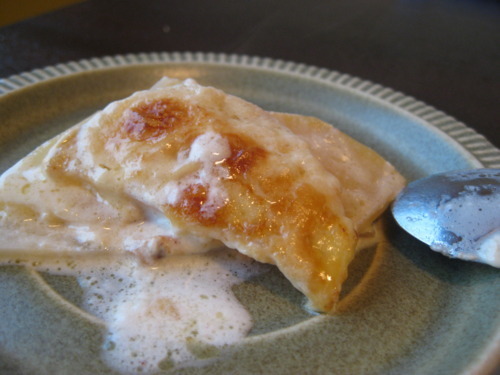 Interestingly, their textures were a little different too – the golden turnip was crisper, the purple softer. 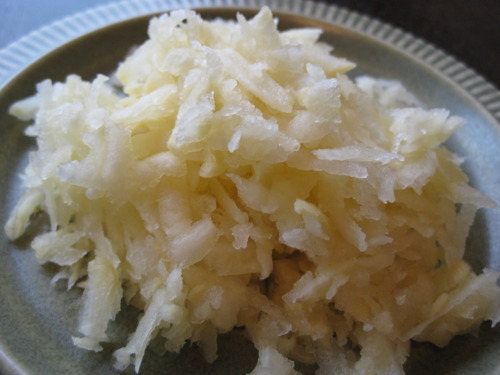 So I grated up my raw golden turnip. And plunked it on a salad. That’s turnip. Not cheese. Salad greens from Alm Hill Gardens. Apples from Tonnemaker. Turnips from Nash’s. Tossed with a little oil and vinegar, a very tasty salad. 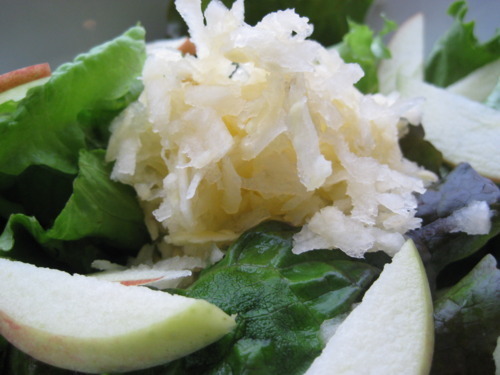 The sharpness of the turnip balanced well with the sweetness of the apples, and grating the turnips adds some nice texture to the salad. Ok, time to cook those purple guys. Peel and slice. 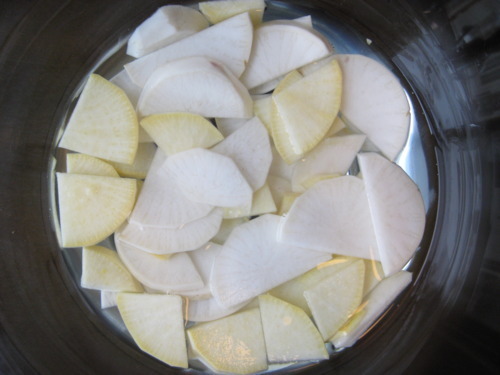 You can see that there is a golden turnip in here too – I had one leftover and decided to slice it up too. Time to make turnip gratin! I used this recipe from Epicurious, but cut in half. And with no sage. And no potatoes. I modified this recipe from Epicurious, I should say. And it was delicious. A very good use of a turnip or two. So! Turnips! Eat them raw if you’ve got golden ones. Otherwise, drown them in cream and cheese. I’m sure they’d be perfectly good roasted alongside some potatoes and parsnips. Root for root vegetables! Yeah! Turnips! Wahooooo! This entry was posted in In the Kitchen (recipes & more) and tagged farmer's market, Lisa Wheeler, local food, Real Time Farms, root vegetables, turnips. Bookmark the permalink. I like my turnips served with cooked turnip greens. I add 1/4 to 1/2 an apple when cooking to sweeten the turnip and greens.